We returned from the Gramps to be greeted by Sydney rain. This was not unusual. It had rained everyday for about 60 days straight. With that said, my pads were trashed and I was resting anyway. About 10 days after arriving home I paid the Wing Cave a visit and, to my surprise, the entire cave was dry! I had never in 3 years seen the lower cave dry! It was amazing! Needless to say, this psyched me up and In quick succession, both Puppy love V9 and Two Mats and a Squeaky Dog were mine. My hesitation in going for the final jug of Puppy love cost me the flash, but my tall man beta got me 2mats in about 15minutes. I then ventured out to the Balkans to put away Dynamite V9, after the previous session of bad beta, I knocked it off 1st shot that day and joined Liam and Sophie out at the Lip. 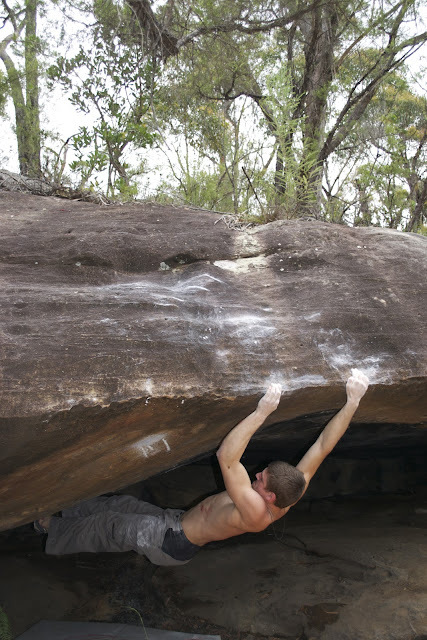 This Crag is sick! Two lines and four problems make up this lowball cave, and all are of the best quality. Having already done one of the sitstarts last year, I gave the link; One Grubby Paw in the Honey Pot a play. This line had yet to be repeated and unfortunately remains so, as my burn got me within a centimetre of the final pocket. This will go down after Europe, but right now I lack both time and space.